A recently unearthed vintage photo from the FIU archives has turned a nonagenarian into a bit of a celebrity. 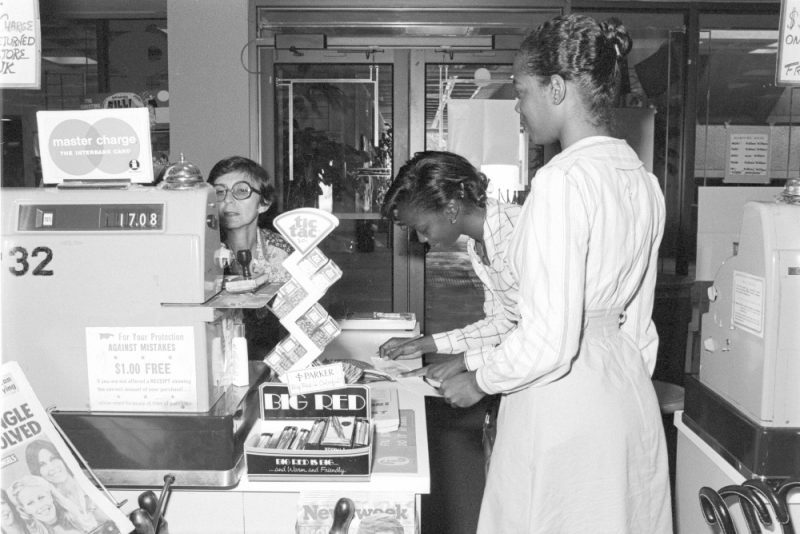 FIU Magazine published a throwback photo on the back cover of its Winter 2018-2019 print edition and asked readers to help identify the three subjects: an FIU bookstore cashier and two students making a purchase. The magazine staff went into near-shock upon learning that the clerk in the 42-year-old snap is the mother of their office coordinator, Consuelo “Connie” Amram. (She serves in the Division of External Relations, Strategic Communications and Marketing, which employs 60 people in five departments.) Once the publication arrived in their respective mailboxes, both Amram and her niece let everyone in on the happy coincidence. Today, Amram’s mother – also named Consuelo Amram – is 90 years old and going strong. She still remembers the 11 years she worked on campus in the 1970s and ’80s. 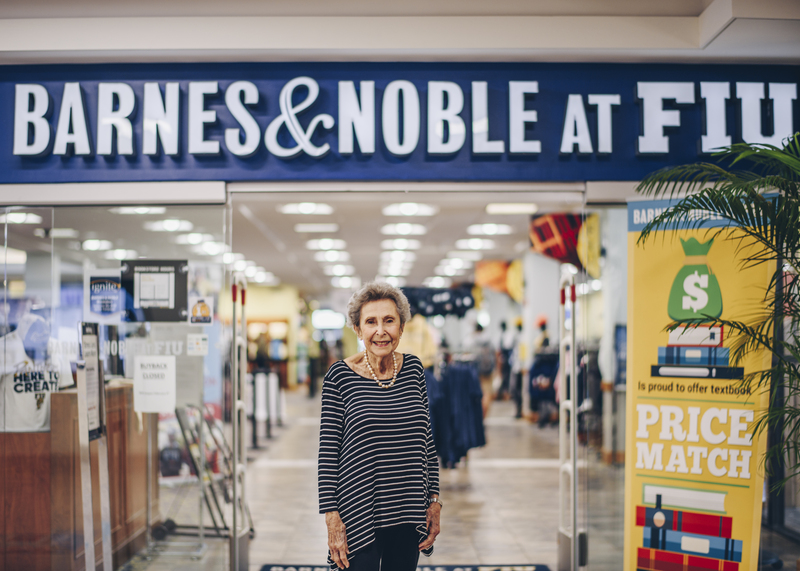 Since those days, one of the lady’s sons and two granddaughters have graduated from FIU, and she marvels at the many changes that have taken place at the university in recent decades. Not only has the bookstore expanded and changed location—it used to be closer to the pit area—but the cash registers are sleeker and no longer manual, people more often than not pay with credit and debit cards rather than cash or checks, a greater variety of Panther gear is available for sale and books can be rented instead of purchased. For all of those differences, however, the older woman and a current student who operates a register at the bookstore today quickly found common ground. The two bonded over the struggle of dividing one’s time between work and other responsibilities. In the case of Amram, she had six children at home; freshman Alexandra Benitez is studying biochemistry. By the time she started at FIU, Amram already had a history of overcoming challenges. She and her husband—now married for 68 years—fled Cuban repression in 1962 before eventually settling in Miami. Her success story reflects a life of dedication to work and family and an ability to count her blessings, she explained. Current assistant manger Marisol Brenes has been at the bookstore for 24 years. While the two women never overlapped in their work, they agreed that a cordial atmosphere is vital to remaining content. Amram still remembers the names of the manager and assistant manager for whom she worked as well as several coworkers who became friends, all of whom she talks about in glowing terms.